For two hundred years we have returned to the novels of Jane Austen again and again, our pleasure and wonder only increasing with each reading. In what lies the matchless appeal of these novels, whose subjects are not the great concerns of the wide world but rather, as Austen writes in Emma, “all those little matters on which the daily happiness of private life depends”? Austen’s novels are an excellent source of advice not because they contain explicit lessons—they don’t—but rather because of what Sir Walter Scott admired in them: “the truth of the description and the sentiment.” Despite the enormous changes in our external conditions since Northanger Abbey, Sense and Sensibility, Pride and Prejudice, Mansfield Park, Emma, and Persuasion were written, human nature is as it was then, and no writer has captured it better. Austen’s portrayal of character is as accurate, amusing, and enlightening now as when the world was first bewitched and delighted by Elizabeth Bennet and Emma Woodhouse. "Jane Austen shares her thoughts about how a true heroine should behave, in a series of 'Dear Jane Austen' letters, with wise and witty answers and 'diary excerpts.' A lot of fun, interwoven with sound literary and social commentary, from the elegant pen of Patrice Hannon. Any fan would be delighted to find this in her daintily embroidered stocking this Christmas." "A thoroughly original self-help book on—to quote from Emma—'all those little matters on which the daily happiness of private life depends.' ... By blending advice, insights and details about Austen's novels, the English professor has served up a very tasty feast indeed." "A witty fiction in which Jane Austen returns to life to dispense advice to contemporary women.... Jane's wisdom on Internet dating, cell phones? Here! Her thoughts on Carrie Bradshaw? Here, too, and just as stringent and bracing as you might imagine." "The author has an impressive and detailed grasp on Jane Austen's novels.... [T]here are few Janeites who will not enjoy spending a few afternoons caught up in the fantasy." "Patrice Hannon's deft ability to weave events from Austen's life into the advice Austen offers is impressive. She captures Austen's tone and personality as she gives Janeites everywhere the taste of sitting down and chatting with a beloved author over a cup of tea and a plate of warm scones." "If you are a Janeite, you will love this book.... In short, every woman should pick up this book." "Hannon's book is sophisticated and even subtle, giving us a believable Austen, one whose observations and suggestions for 'heroines-in-training' come from the spirit of her novels." "Patrice Hannon provides an erudite and amusing epistolary novel in which Austen advises the love- and other-lorn on appropriate conduct and truths universally acknowledged, using examples from her own work." "...[One of] a few 'sleepers' you shouldn't miss." "The author does a great job channeling Jane Austen." "Borrowing Austen's combination of charm and pragmatism, the author imagines how Austen's keen observations would translate to modern-day dilemmas." 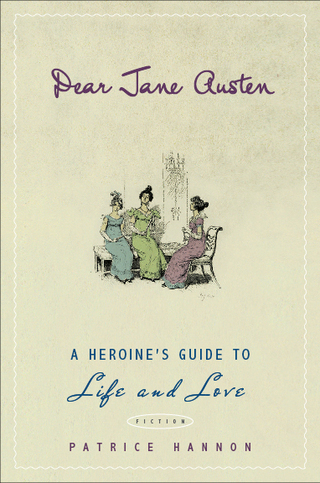 "In Dear Jane Austen: A Heroine's Guide to Life and Love, Patrice Hannon answers questions from modern would-be heroines in the voice of Jane Austen, bringing her sense of style and subtlety to the women of today.... a must-have piece for the library."